It is useful to be able to find out, for a given block of seismic data, what filters have been applied to it to get it into its present form. Minimus digitisers do not populate the TTL byte when generating GCF data. The FIR filter information for a Minimus is available directly from its web page, on the Data Flow tab. Please see the Minimus manual for more details. There is no equivalent method for CD24 digitisers. GCF files and data streams include a TTL (tap table lookup) value located at byte 12 (starting from 0) in the header, which is used to transmit filter information. Earlier firmware revisions did not implement this byte, and you can expect it to be set to zero. Status blocks and auxiliary (Mux) data channels do not include filter information, and in these blocks the reserved byte is also expected to be zero. The meaning of other values of this byte depends on which digitiser type you are using. The digitiser type can also be determined from the GCF header. See Guralp Compressed Format (GCF) for more information. Consult the individual filter coefficient pages (links above) for the details of the meaning of the TTL byte for each type of digitiser. MiniSEED files produced by Scream have the TTL value encoded into the first byte of the padding after blockette 1000 within the MiniSEED packet header. This is not part of the SEED standard: it was implemented after a request from IRIS in 2007. Most miniseed reading programs will completely ignore the extra information, because it is in bytes that are "unused" according to the standard. For information about the SEED standard, please see the SEED manual. Select the required program (service) by clicking on . This will display the log viewer and a list of recent entries. Scroll down the list until you find the required GCF block. The TTL value is deisplayed in the details column. If you are not using an EAM, Guralp Systems provides software for both Linux and Windows that allows you to determine the TTL value directly from the recorded GCF data. The program exposes the digitiser type and the TTL (tap table lookup) value. The easiest way to examine GCF files under Microsoft Windows is the shell extension GCFinfo, which is free to download from this site (see the GCFInfo page). Full documentation for GCFinfo is also available. Obtain gcfinfo.exe and, if necessary, the library file qtintf.dll which it requires. Place these files in the same directory as each other and run gcfinfo.exe to install the shell extension. Navigate to the GCF file you want to examine, and right-click on it. 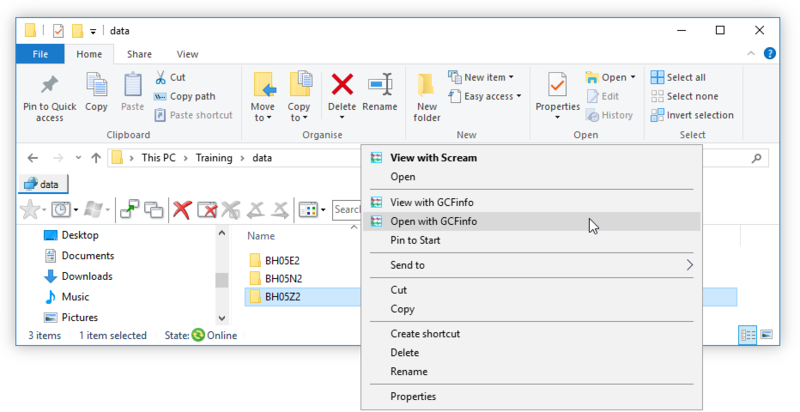 You will see two new options in the context menu: View with GCFinfo and Open with GCFinfo. The program's main window lists the System and Stream IDs and Start time of the first block in the file and the End time of the last block in the file, together with the total number of blocks (# blocks). This table shows the header information for each block in the stream you selected. The byte used for filter information is the Reserved byte in column 5. In the example above, it is 53.